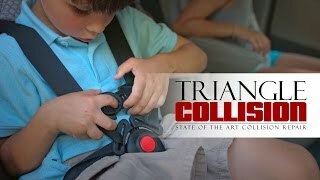 Triangle Collision has a state-of-the-art facility that can repair your Chevrolet back to pre-accident condition. We not only restore your vehicle, but your peace of mind as well. We take the hassle out of the auto repair process with convenient services such as 24/7 towing. Our goal is to get our customers back on the road safely. If you live in the Morrisville or Cary area and have a Chevrolet that was involved in an accident, contact Triangle Collision at (919) 460-7693 or click here to contact us online! Triangle Collision offers Lifetime Warranties for Chevrolet repairs and paint. We stand behind the work of our highly trained and dedicated technicians and guarantee that you will be happy with the results. We are a collision repair shop built for the modern automotive world. Your Chevrolet has been designed to incorporate advanced technologies and structural components. In order to maintain the performance and safety of your vehicle our technicians follow strict guidelines handed down from the manufacturer. We also have advanced in-house refinishing tools. Not only will your vehicle be driving like it did before the collision, but it will look just as good too. It’s your choice where you take your Chevrolet after an accident, not the insurance company’s. So bring it to Triangle Collision, where you know you will receive good customer service and a repair you can trust. Our technicians understand that each car that comes into our shop needs personalized service. They put in the extra effort to not only repair your vehicle to the highest of human ability, but to make sure that all of the damages are found and dealt with. Many shops might miss crucial damages that could put your safety at risk, or diminish the value of your vehicle. This is why it is important to get a full vehicle inspection after a collision. Triangle Collision also offers the highest quality collision repair paint services in automotive refinishing. Using a high tech camera, our certified paint technicians are able to find an exact color match to your vehicle with a computerized mixing and measuring system. Our facilities are equipped with BASF refinishing technologies. BASF is the global leader for automotive paint and refinishing technologies and is certified by all original equipment manufacturers. We also use Garmat climate-controlled paint booths. With these tools we will be able to perfectly match your Chevrolet’s original paint job. Your vehicle will show no signs of a collision from the inside and out. We are also partnered with Lemon’s Wrecker Service, a family owned and operated towing company. They offer 24/7 towing and hauling service to the Triangle area. They bill us directly so we can add it to the overall price of the repair. This will help you recover the cost with your insurance claim. Dealing with the insurance company is additional stress that you do not need after suffering a collision. We know how to deal with your claim to ensure that your vehicle is returned to pre-accident condition. It’s your choice where to take your Chevrolet after a collision. Make sure you receive the high quality repairs that you deserve. Chevrolet vehicles have millions of dollars worth of research invested in the advanced safety features of their new vehicles. While lifesaving, these features require special care when being repaired or replaced. They have been designed meticulously and must be installed exactly as the factory designed them. This is why a one-size-fits-all repair is unacceptable on modern vehicles. Our technicians follow repair guidelines from the factory to make sure that our customers leave our shop with a vehicle that is safe to drive.